The moon Mimas, at 115,204 miles out from Saturn, is the innermost of the planet's seven large moons. With a diameter of 246 miles, it is the twentieth largest moon in the solar system. It orbits Saturn in just under one day. As you can see, it's quite heavily cratered, but dominating the surface is a huge impact crater, which is 81 miles across. This crater (named Herschel after the moon's discoverer), makes the moon look uncannily like the Death Star from the Star Wars films, with the crater being the superlaser. The resemblance is pure chance, as the film was made three years before the crater was discovered. A case of life imitating art, eh? 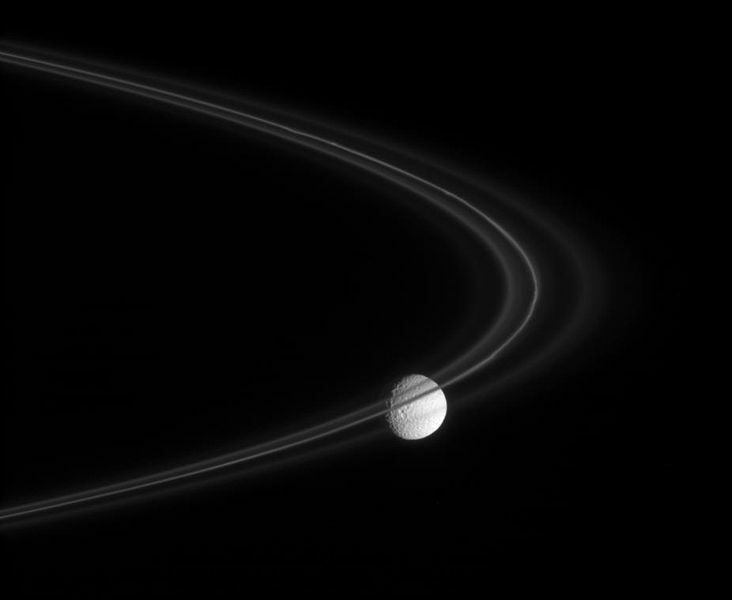 Also apparent in the above image is the fact that Mimas is quite spherical. 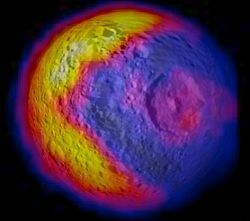 Heavenly bodies have to be a certain size for their own gravity to draw them into a spherical shape and it is thought that Mimas is of the smallest possible size for this to happen. 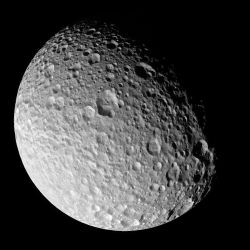 It appears that Mimas is composed almost entirely of water ice, with a small amount of rock. This accounts for its low density. As stated earlier, its surface is pretty much totally covered with impact craters. The huge Herschel crater has walls that can be over three miles high. It floor can be over six miles deep. The central peak is 3.7 miles high. None of the other craters come close to matching Herschel in size. Most of the other craters are in excess of 25 miles across, except, for some reason, in the south polar regions, where their sizes are restricted to 12 miles or less. Other geographical features observed on the moon Mimas are chasms and "catenae" (crater chains). 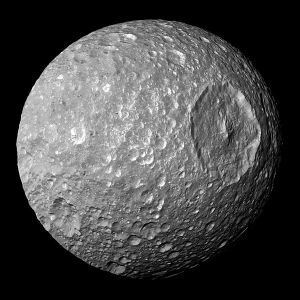 So, from being the Death Star, Mimas has now turned into Pac-Man. Crazy!